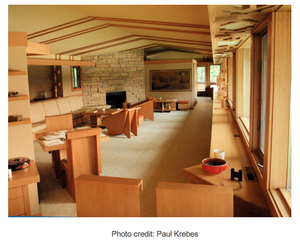 “Redleaf” Krebes Residence will be open to MnSAH (Minnesota Society of Architectural Historians) members to tour May 18th, 2013, 10AM to Noon. Mr. Krebes and Howe first met in 1943, while John was teaching a drawing class. They and their wives remained friends the balance of their lives. Bill was a furniture builder, and with John’s design skills – their interests oftentimes intersected and they collaborated together on various projects. They even had summer and winter homes nearby to one another in Minnesota and Arizona. Rob will be speaking on the upcoming documentary about John Howe, the home’s architect and have excerpts of the film for viewing. this article MnSAH is Seeing Red this Spring!